A good source of protein! Do not disturb. BFC file photo. Even at 6,600 feet above sea level, with about five feet of snow still blanketing the earth, spring is in the air. The days are starting to grow warmer and they are getting much longer, and the tremendous amount of snow we’ve gotten is starting to melt. This is a very difficult time of year for the buffalo, and for all grazing animals, because when the snow gets soft in the daytime, it freezes solid at night, making it extremely difficult to crater through to get to the life-giving grasses below. This is the time of year when buffalo, elk, and others surrender to the stresses of the long winter. While it feels sad to see these creatures grow thin and sometimes die, there is a larger purpose to these natural deaths, one of them being to provide food for waking grizzly bears. Grizzlies in Yellowstone country very much look forward to waking up and finding winter-killed carcasses of buffalo and elk, their main source of food this time of year. At least two male grizzly bears have emerged from their long winter naps, and having not eaten for many months, they are hungry and a little bit grumpy. 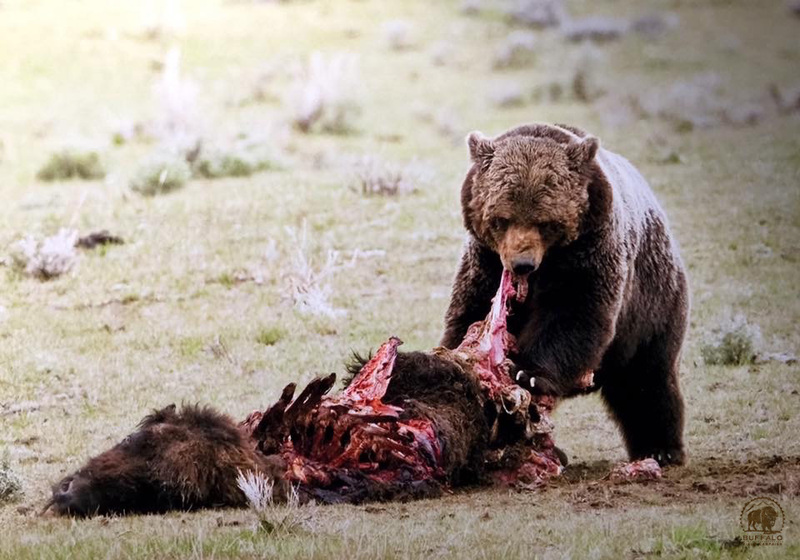 This is the start of the “bear aware" season, and if you should come across a carcass, it is best to put a great distance between it and yourself, as grizzlies don’t really appreciate their meals being interrupted. With the mild start to the winter, it’s hard to say how much food grizzly bears will find. Buffalo and elk have been looking fat and healthy most of the year, though right now is when the season is extremely challenging for them. What an honor for a buffalo to become food for a grizzly bear. A herd of buffalo just having passed by Yellowstone’s trap, on their way to Beattie Gulch. Photo by Kurt Rowe, Buffalo Field Campaign. As we reported last week, buffalo have started migrating into the Gardiner Basin. Unfortunately, hunters are along Yellowstone’s north boundary, awaiting them. 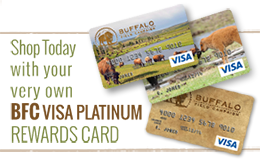 Since our last report another four buffalo have been killed by hunters, all at Beattie Gulch, a place we also refer to as the killing fields because it is a tight, bottle-necked migration corridor where hundreds of buffalo have been gunned down over the years. Turning around to seek shelter in the Park doesn’t always turn out well for the buffalo either. About a mile south of Beattie Gulch, inside the Park, is Yellowstone's Stephens Creek buffalo trap. So far, no buffalo have been captured, but the Park intends to keep the trap open for the next few weeks, and hunting will continue into late-March. Keep in mind that the start of calving season is less than a month away. While twenty-eight buffalo have so far been killed this season, Yellowstone and other buffalo “managers” intended to kill nearly a thousand. We are so grateful that the buffalo are keeping themselves alive, though in the larger picture we must ask the question: why aren’t they coming into Montana? It could be due to the mild start to the winter, plenty of grass was still available in the Park, so migration instincts weren’t triggered. Or, it could be that so many of the lead females have been killed over the years that migratory memory is being compromised. And, we also have to give these highly intelligent relatives the credit they deserve: they know when it is safe to be in certain locations. Likely, it is a combination of all of these things, the current buffalo “management” plan has altered the buffalos’ behavior in ways humans can not even fathom yet. The stand off. Photo by Sandy Sisti, Wild at Heart Images. Here in the Hebgen Basin, on the west side of Yellowstone, things remain eerily quiet in the field. With no buffalo around, patrols are continuing to check migration corridors, anticipating their arrival. One of our patrol areas, however, is currently closed to humans to protect waking grizzly bears, so most of our focus has been along the Madison River corridor. On patrol the other day, we skied out to a place inside the Park that we call Buffalo Meadows. There has been a solitary bull hanging out there for most of the winter. We found him, grazing peacefully along the river’s edge, when out of the blue sky, an immature bald eagle flew down and over him, then swooped into the trees. A moment later, from where the eagle disappeared, two wolves arrived! We were so excited to see them and wondered how things were going to play out for the bull. 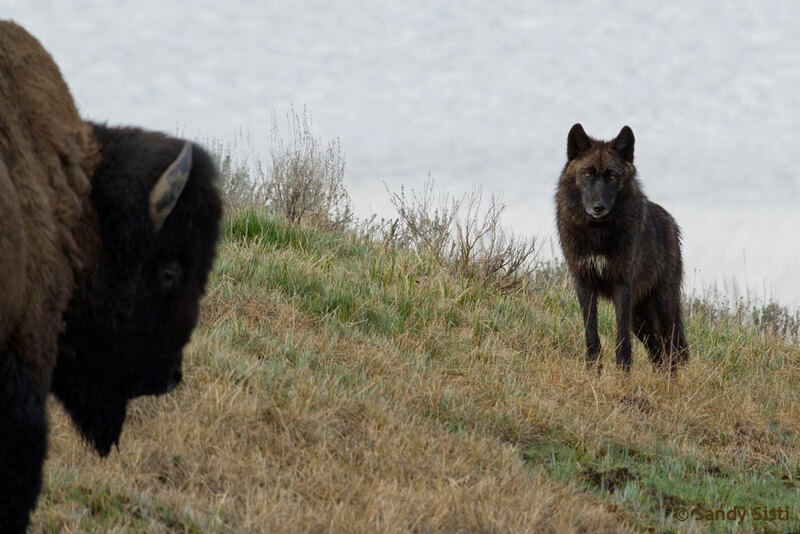 The wolves were heading straight towards him, but with just the two of them, even a lone bull is an extreme challenge. As the first wolf approached, the bull raised his tail and then shook his massive head — two sure signs that he was none too pleased. The wolves, knowing the odds were against them, just trotted on by. Soon after, the bull bedded down, relaxed. The wolves stayed in our sight for about thirty minutes and we did get to see a few geese escape from being a menu item. Buffalo, eagles, wolves — what an honor and blessing it is to be here on this awesome landscape, living among these sacred relatives. Of course, our Gardiner patrols had it even better; just the other day they got to see a pack of eleven wolves, including three pups! It is moments like these that remind us of why we are here doing this important work, and from the bottom of our hearts we thank each and every one of you for making it possible for us to be here on the front lines, working in defense of the last wild buffalo and all the wonderful creatures who call this majestic part of the world home.